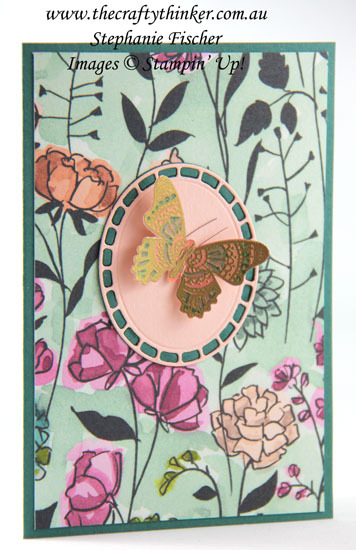 Share What You Love Specialty Designer Series Paper and the Butterfly Gala Bundle - a match made in heaven! Especially with a little of the Grapefruit Grove Foil Sheet thrown into the mix: the lustrous opalescence of the paper and the gorgeous shiny iridescence of the foil! Neither of which shows up in my photos! 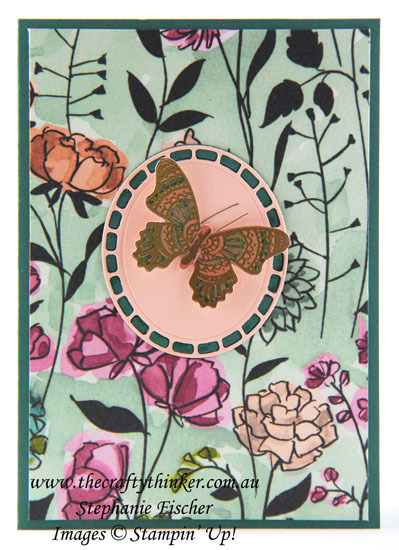 The butterfly was gold heat embossed on the foil sheet and then coloured in places with a Bermuda Bay Stampin' Blend alcohol marker before being punched out with the coordinating punch in the bundle. The Grapefruit Grove Foil Sheet is available FREE until the end of March with any product purchase of $90. To obtain the two-tone label, I cut two of them, one in Petal Pink and one in Tranquil Tide. Keeping all of the pieces intact in the green one, I glued it to the card front. Having removed the little edge pieces from the pink one, I glued it on top of the green one.